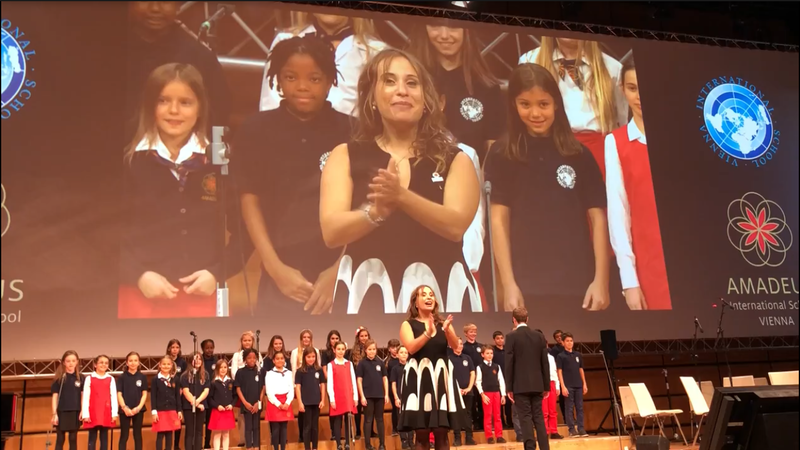 At the opening ceremony of IB Global Conference in October, students from Amadeus International School, Vienna, Austria, sang in front of a packed auditorium of over 2,000 educators. As well as entertaining the audience, the performance offered an active and meaningful learning process for the primary and secondary students involved. Lidia Campanale, Primary Years Programme (PYP) Music Teacher and Choir Director at the school, believes that that the way we teach arts subjects—music, visual arts, dance and drama—must become “a manifesto of student agency”. The conference performance pieces included an Andalusian/Arabic piece, representing inclusion and peace between nations; a traditional piece from Styria in Austria; and a modern vocal piece to send a message of living our lives to the fullest. Campanale explains that, “students chose with teachers which repertoire to submit for the conference following criteria that we set together as a group. Students analysed and linked musical features and elements of the traditional pieces we performed to other musical works they were studying in class. “They shared the lead during rehearsals by conducting the others and making artistic choices on how to interpret the repertoire. Primary and secondary students were active in all the processes. Some of our students recorded themselves to support the group with the Arabic and German pronunciation. They contributed by sharing stories and meanings that were part of their life experiences and were linked to the context of the songs. They were also active in the arrangement we created for the modern vocal piece,” explains Campanale. The conference performance is just one example of how inquiring into the arts can help students develop agency, skills and international-mindedness. “In order to make this learning journey meaningful, driven by students’ interests and often initiated by students, teachers need to go through a selective process of resources that must involve authentic and traditional works of arts,” believes Campanale. “Through the arts, students have direct hands-on experience with the enormous hidden treasure behind cultural heritage, and by using that coded narrative, sounds, images and symbols they are able to hear, play, draw, analyse, review and recreate concepts that are at the base of those artworks and masterpieces,” says Campanale. She believes students should be invited every day to respond to stimuli; explore and inquire into the key concepts behind activities; share and create together, perform using different mediums and share responsibilities for the artistic outcome; and most importantly think and reflect on the process. “By interpreting and performing works of art, we help preserve the values and the truths that our societies hold and we equip our students with the soft skills they will need to become global citizens of the future,” says Campanale. Visual art, dance and music can be used to link local and global issues as well as deepen understanding of cultures and international-mindedness. “In the arts, one needs to enable students to look beyond artists and performers of the Western world and look at the transformation of art within Asia, Latin America and Africa,” says Dissanayake. IB learner profile attributes are also stimulated. For example, in visual art lessons, students can become knowledgeable, reflective and thinkers when exploring how the materials they are using may be environmentally friendly or sustainable, or when they learn the many ways to communicate through the arts. “By performing and evoking real and authentic expressions of world cultures, arts classrooms change into micro communities that share responsibilities for the artistic process and encourage the natural development of the learner profile attributes,” says Campanale. The future is in new types of practices such as voice choreography, painted singing, intelligent and virtual choirs, explains Campanale. The intelligent choir is a concept of training choir conductors to inspire choristers to share responsibility for the musical process and enhance reflection, creativity and interaction.